Gaelic Storm is a highly-acclaimed Celtic band. Their music ranges from traditional Irish and Scottish music to original tunes, in both the Celtic traditions. Gaelic Storm’s origins can be traced back to 1996, when Patrick Murphy and Steve Wehmeyer joined with Steve Twigger and Uillean piper Brian Walsh to perform at O’Brien’s Irish Pub and Restaurant in Santa Monica, California, of which Murphy was the manager. This led to a number of pub performances for the next year. 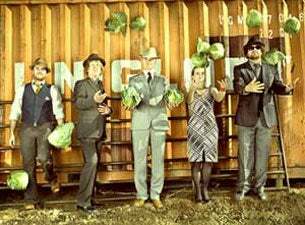 Read more about Gaelic Storm on Last.fm. Here are some industry leading presale databases we recommend you use if you're in need of a Gaelic Storm presale password to buy early tickets to see Gaelic Storm performing live. Getting your tickets early is a great way to get great seating and secure your tickets before they sell out during the public onsale.